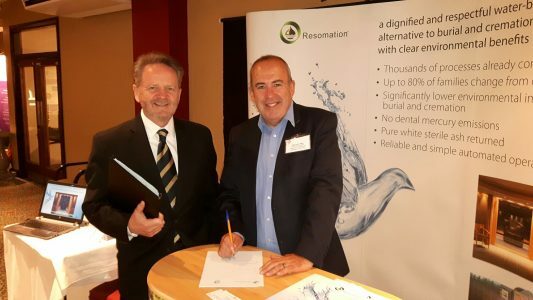 Resomation exhibited at the CBCE 2017 event last week. There is a growing level of acceptance across the UK in this form of green cremation and some good opportunities to develop. The conference was opened by Harvey Thomas CBE, Chairman of the Cremation Society of Great Britain. 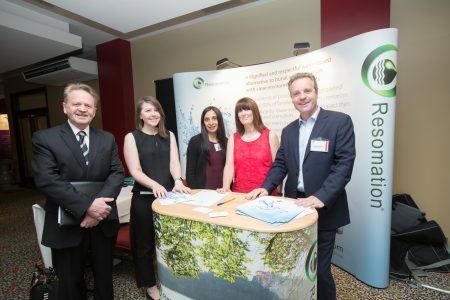 A range of good quality and informative presentations were made on issues and new technologies in the funeral industry. Pictured is Brendan Day, Technical Co-Ordinator, Federation of Burial and Cremation Authorities with Sandy Sullivan on the stand. 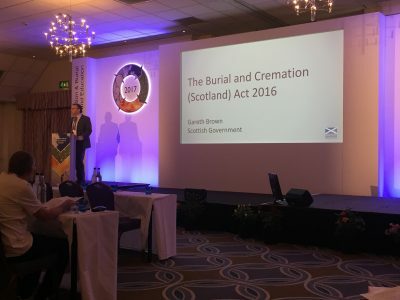 The Scottish Government’s Deputy Director, Health Protection and Public Health Reform, Gareth Brown presented on the changes in the Burial and Cremation (Scotland) Act 2016. During subsequent discussions with Mr Brown, he expressed his support for the introduction in Scotland of alternative technologies such as green cremation. 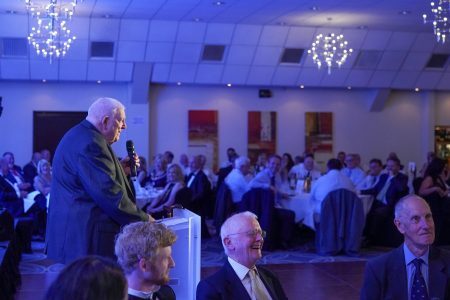 An enjoyable evening was had by all who attended the annual CBCE conference banquet. The three-day conference was very informative with good, positive, increasing enthusiasm for Resomation. Resomation also received good coverage in a feature in the Summer issue of The Cremation Society publication Pharos International on ‘Resomation has the least impact on the environment’.